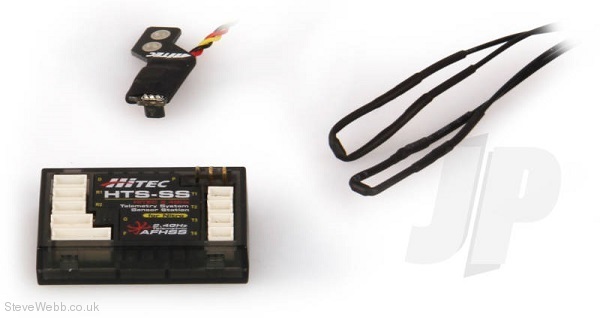 2.4GHz Telemetry System Sensor Station Combo Pack’s - The Telemetry System, HTS-SS (Hitec Telemetry System – Sensor Station) will show you a new way of flying your aircraft. Ever wondered what’s going on, on board your model? Wonder no more. Hitec proudly announces Hitec 2.4GHz Telemetry system, which enables you to monitor various kind of flight information right in front of you. Utilizing Hitec’s 2.4GHz AFHSS technology, you can view real-time information on the screen of your Aurora 9 or on a PC monitor using the Spectra 2.4 modules and HPP-22 PC interface.